Pandemic is full of teachable moments, especially if what you want to teach is the crushing inevitability of failure and the futility of anyone doing anything to avert a global epidemiological crisis. The game theme itself is extremely inclusive – everyone is going to die. But does the game itself follow this laudable philosophy of anti-discrimination? We gave it four stars in our review, so it’s well worth making an effort to find out. I’d like to be the green one. Or the other green one. Mine is the green one next to the green one. 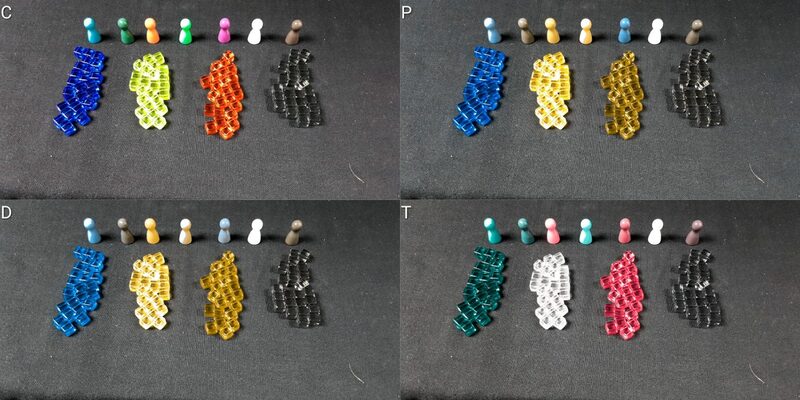 That means that for all categories of colour blindness there are certain role combinations that will be impossible to play using the provided pawns. 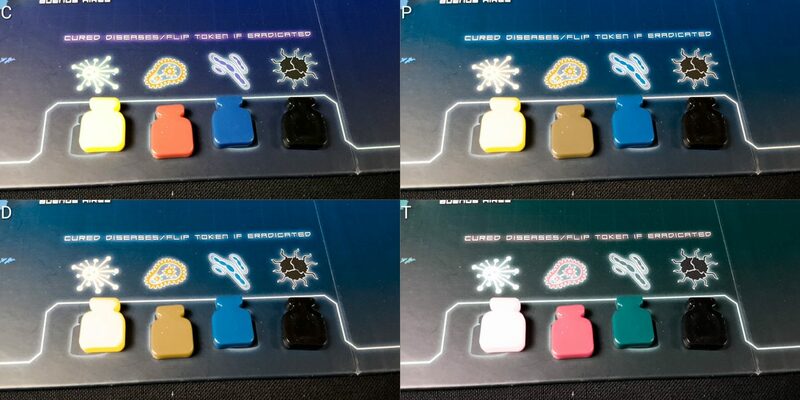 Unfortunately, the colour-coding of pawns isn’t just a visual marker, they’re also signalling information for other players. If you want to know where the medic is, you look on the map for the orange pawn. That’s vital information, because it influences the strategy of decision making. Pandemic is a game of managing logistics, and knowing the easiest way to get a medic into a hot-spot is eased by being able to tell at a glance where the medic is. Now, you can work around this by taking a pawn of a more suitable colour and using that instead, but then everyone has to remember that the pawn they see on the board isn’t actually matched to the colour of the role on the card. The usual solution of just making use of meeples or tokens from other games is as applicable here as it is anywhere, but you really shouldn’t have to do that. If you’ve got more than one person with colour-blindness playing a poorly discriminated role, you’ve now got the problem of remembering which external token maps on to which role. There’s a world of difference from looking over to Tehran to see your quarantine specialist, and looking over to see the Scotty Dog from Monopoly. Having a massive dog the size of a city romping through the urban landscape is a somewhat different global emergency, and you just don’t have the time to deal with another one. There’s a lot you need to take care of in Pandemic, being able to tell what player is where shouldn’t be added on to that burden. It is though playable with care. For those with other visual impairments, I’m not sure we can Recommend pandemic – the cubes are very small, and the number of them on the board at any one time is substantial. More than this, the cubes themselves are the same colour as the city markers which makes being able to pick out where the map begins and the diseases end is tricky. To heap on problems, the simple natural course of play tends to result in cubes being slowly disconnected from where they were played as the board is jostled and new cubes are placed around. Some populated areas of the map are very dense, and reasonably sharp visual focus can be needed to see which cubes relate to which cities. Cities too can easily become extremely visually cluttered, containing multiple cubes of different types, several pawns, and a research centre. There isn’t enough room on the map to easily fit all of this onto the space a city would contain, so it all tends to getscramped up into a single roughly contiguous blob of important game state. I’d visit, if I knew where it was. 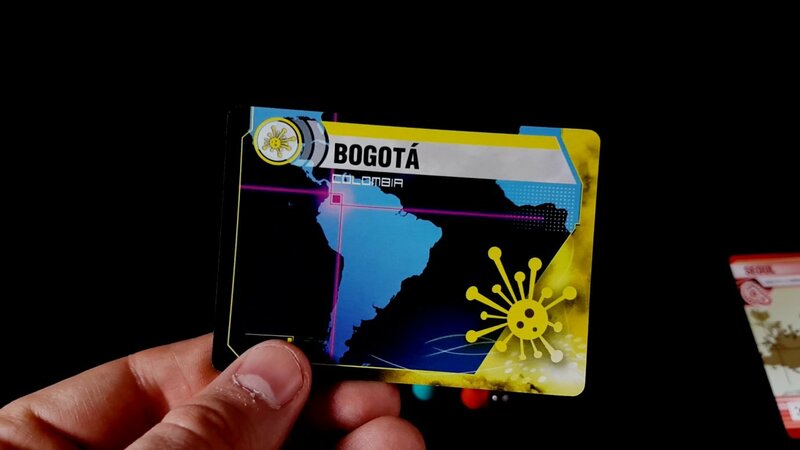 Player cards have a similar problem – they’re well differentiated in terms of colour, but are very cluttered and it can be difficult to pick out where on the map it’s supposed to go if you’re not 100% sure of your geography. Even if you are, the cities are all in subtly different places to where they should be. There are guiding lines, but their usefulness depends heavily on your visual acuity – for many categories of visual impairment, they won’t be easy to perceive, or won’t be perceived with sufficient preciseness to meaningfully narrow down the location. Which of the dots in this pile of dots is the dot I’m going to? Role and epidemic cards have a different issue – they have lots of tightly cropped, densely layered text that outlines sometimes complex process and procedure. It’s all outlined in the manual, so you don’t need to rely on the actual card, but that’s something that’s almost certain to get in the way of normal game flow. There’s so much game state in play at any one time, and so much of it is linked to the ability to work out where the important disease hot spots are. Exploring the map with magnifiers and other accessibility tools is possible, but the whole heart of Pandemic is a system of escalating troubleshooting. Cities don’t gradually become more dangerous as you leave them to decay, they almost instantly become your major worry over the course of a single turn of a card. If you’re playing a large game with many players the map when you get to it on your turn will be radically different to how you left it. More, Pandemic is a co-operative game, and you’ll be expected to contribute plans and strategies to the effort as other players are able to effect it, meaning that you need to be constantly aware of what’s going on, why, and where everyone is. Cubes differentiate only in terms of colour, meaning there are no tactile clues as to what cube you may be dealing with – that can make it difficult to change or interpret the game state on your turn. Adding cubes is difficult enough, but removing cubes is very tricky given how dense they may be in a particular area of the board, and how many different colours of cubes may well be present in a single city competing with precious space with pawns and potentially research centres. In its favour, Pandemic is a co-operative game and as such the design of play is that everyone helps everyone else. There’s no game impact from having others around the table tell you what’s in your hand, or handle fine-placement of game pieces on your behalf. We’re willing to accept that those with acuity related visual impairments will be able to play Pandemic with care and with some assistance. Our tear down though is based on what you have out of the box, and on those grounds we can’t quite recommend it. The game has a significant burden on memory, due to the way that the infection deck intensifies. As we said in the review, this is as clever as the Dickens and it might well be my favourite game mechanic in any game I’ve ever played. However, it creates an issue for those playing with cognitive impairments because of the additional burden it places on remembering what’s coming in the deck. When there’s a discard pile, it’s possible for a player to remind themselves as to what has happened by browsing through it. Once it’s on the infection deck, you need special cards to do that. Linked to this, the game play *weight* of cards that are returned to the infection deck is much higher than those that will come later. If you can’t remember, at least to an extent, what’s on the deck and how likely it is to be drawn you’ll find it much more difficult to contribute to collaborative strategising and risk management. That’s unfortunate, because while Pandemic is a game of logistics it’s also substantively a game of mitigating oncoming dangers. You can’t divorce that from the rest of play and still have an equivalent game experience. You can get help from other people in this area, but then you’re leaning into the problem of quarterbacking that Pandemic already suffers from. It’s not recommended for those with significant memory impairments. If this causes an outbreak, increase the outbreak counter by 1. If this causes an outbreak on any city, except one that already had an outbreak as part of 1) go to 3). The second draw by comparison may simply be ‘put this card in your hand’. This high variability makes it difficult for those with cognitive impairments to get into a comfortable groove. There are numerous special rules that need to be taken into account here. There are rules regarding how many cubes can be placed in cities – three maximum per cube colour, but a maximum of 12 for cubes of all colours. There are rules regarding how often cities can outbreak – only once as the result of a single turn of a card, but as many times as is needed during a single player turn. Even player pawns may have an impact. The quarantine specialist for example prevents outbreaks in her city, and stops disease cubes being placed in her city and adjacent cities. The medic prevents cubes of cured diseases being placed in his city. It can be an awful lot to keep in mind at any one time, and much of it is conditional and only temporarily relevant as players move around the map – what was true last turn may not be true in the next. This extends down to actions too – if you’re a medic, and you move through a city with a cured disease, you now clear all of those cubes away simply by passing through it. That’s phenomenal, if you remember that’s something that happens. It’s contingent on a cure after all, and is not a normal part of day to day play. When something happens in the game, it makes something else happen from that point on – this kind of conditional rule change can make it tricky not just because of the change in flow, but because of the way it hugely alters the strategic value of actions in the game. Suddenly your medic’s key contribution might not be in the curing of three cubes with one action, but instead the passive curing via movement. Everything needs to be re-evaluated in that light. In many games you could simply downplay that kind of change in planning, but in Pandemic it is an issue because of the heavy weight of each decision – you can set yourself on a path to failure with one wrong action. It doesn’t even need to be *wrong*, it can just be sub-optimal. Even on the easiest levels of the game, it’s a punishingly difficult experience until you get the hang of what you’re doing. As with visual impairments, it’s co-operative so it’s okay to ask for help and guidance – but it’s a thin line separating that and other people actually playing your turn for you. We don’t recommend it for those with cognitive impairments. This is a bleak game. The first half dozen or so times you play it, you’re going to fail. Not just fail a little bit, either – you might cure a disease, or even two, but at the end the map will look like some diligent and jet-setting serial killer hacked a Lego figure into a thousand bits and scattered them across the globe. It’s not going to feel like you achieved much, and the more epidemic cards you’re playing with the farther you’ll feel from being a hero. Like Galaxy Trucker, it’s a game that generates opportunities for failure rather than one that empowers wish-fulfilment. However, unlike Galaxy Trucker it’s co-operative game – you’re going to fail, but at least you’re going to fail together. That might be enough to offset the anger and frustration that might accompany certain emotional and behavioural disorders, but it’s going to vary from individual to individual. On top of this though is a strange combination of factors – aside from the order of the cards, the game is completely deterministic – the card will resolve itself in the same way each time. But despite that, the game can seem almost malevolently vindictive as a direct result of the epidemic cards. Failure isn’t incremental, it’s almost instantaneous and is often cascades in a catastrophic way. This, combined with the challenge that the game presents, makes it seem like winning and losing are arbitrarily decided without your input. To be fair, this isn’t entirely wrong – it’s possible to create a starting game state that is entirely unwinnable, and an epidemic card drawn early has a much more injurious impact on the probability of winning than one drawn later. But even in cases where the game is winnable from the start, it’ll feel very unfair as its internal apparatus starts to spin up. Your fate isn’t arbitrary, but you’d be forgiven for thinking it is. The nature of the game too almost pathologically prevents any kind of closure unless you’re willing to sacrifice optimal play. The eradication mechanic requires all cubes of a certain colour to be wiped from the board, at which point you’re finally done with that disease. Doing that though almost always allows other diseases to spread and intensify to the point of unmanageability. Those that need a sense of completeness for personal satisfaction will likely find the earlier issues of emotiveness are much heavier burdens because of it. But again, it’s co-operative – everyone succeeds or everyone fails, and that mechanic can create a kind of esprit de corps that can overcome the individual frustrations and anguishes that a player might feel in a competitive game. You might hate the game, but at least you can hate it as a team. Pandemic then is tentatively recommended, but you’ll need to assess it on a case by case basis yourself with the people with which you’d be planning to play. As a physical game, Pandemic has positives and minuses. We wouldn’t recommend it at all to a group where everyone has physical impairment, but the co-operative nature alleviates most of this in mixed-ability groups. As long as one person can place cubes and move pawns, it’s fully playable. Admittedly, you do need to sacrifice a considerable degree of personal agency to accomplish this, but nothing in terms of game-play is lost. However, for groups where this isn’t an option the game remains fundamentally inaccessible – the cubes are tiny, must be positioned precisely and manipulated with a reasonable degree of fine-grained control. This was an issue for Galaxy Trucker too, but here we see the difference that a coherent way of expressing intentionality can make – all instructions can be precisely articulated without ambiguity. This is handy, because as with Carcassonne an unfortunate physical spasm can alter the entire state of the game by scattering cubes and pawns to nearby adjacent locations. The game enforces a hand limit of seven, and recommends that the cards are kept as hidden information. When Mrs Meeple and I play though, we tend to leave them face up so everyone can see. This does exacerbate the quarterbacking situation, but we find that it’s not really a regular problem in day to day playing. As usual, a card holder is an almost mandatory supporting tool for board games involving cards, and a standard sized holder would be fine for dealing with most of the cards in your hand. There’s not a lot of hand manipulation required, although the usual in-hand sorting of colours is useful. There are though never so many cards that it’s essential. We are prepared to tentatively recommend Pandemic with the assumption that there is someone at the table that will be able to do the manipulation of cubes and pawns. If not, steer well clear. Like many co-operative games, Pandemic is a game about communication. The logistical and risk-management issues mean that communication often needs to be deep and well argued, because individual mistakes become team failures. Everyone is trying to solve a moving, intricate logic puzzle that is speeding up and becoming more intricate all the time. A typical strategy discussion will involve things such as optimal routes, assessment of hot-spots, likelihood of encountering outbreaks from the infection deck, the time-limit represented by the player deck, the dispersal and distribution of player pawns, the cards available to the group, and the long term likely epidemiological pattern of individual diseases. Strategy is deep, in other words, and requires people to communicate relatively quickly and comprehensively. We tend to work on the assumption here at Meeple Like Us that communication is mostly a solved problem for the individual groups that may play a game. We assume you communicate with everyone in the group anyway, and games are mostly an extension of normal social engagement. For Pandemic though it’s the nature of the communication that makes it difficult – language barriers, deafness and articulation impairments are all going to make it difficult to contribute to ongoing discussions. The discussions too will tend to cohere around concepts and emergencies that are of relevance only to play in Pandemic. We’re still going to recommend it, but bear this in mind – it will have an impact on how satisfying the co-operative play will be. Pandemic does a good job of presenting itself as a game of inclusivity, mostly. It has a good gender balance, and it tends to act against common stereotypes – the scientist is a woman, as are the researcher and the quarantine specialist. The rest are men, including the medic. There’s nothing to complain about here, as even the box is reasonably inclusive in its art – the scientist gets main prominence on the front, with three of the male roles behind her, but the quarantine specialist is also on the cover on the sides. Whether prominence is more important than quantity of representation is a matter for debate, but the important thing is that it’s handled well enough to even warrant a debate. The quarantine specialist is the only one that looks like she isn’t completely Caucasian, and even then what ethnic diversity is there is very much skewed towards the lighter of skins. I would have very much have liked to have seen a broader range of ethnic groups represented, especially in a game that has a such a wide and global scope. There’s a hidden, and I expect unintentional, subtext in the game of the white, educated professionals of the west coming in to sort out the problems of the Africans and the Asians. It’s extremely unfortunate. It makes me think of the novel World War Z, which is much stronger as a result of its explicit and inclusive internationality. Pandemic, in comparison, just seems a little parochial. Those with visual and cognitive issues may find the geography of the game difficult to deal with since it requires an understanding of location, as well as a degree of flexibility in searching it out when it’s not where you’d expect. The game encourages hidden hands to discourage quarterbacking, but it’s not a key element of the game as discussed above – as such, the accessibility issues that normally come with this in terms of compound cognitive and physical impairments are alleviated considerably. The issues of visual and physical accessibility regarding the size of cubes is multiplied when someone has impairments in both categories – it becomes far more difficult to make use of supporting tools to examine the map, and the fragility of the board-state means that even an occasional slip can change everything. Similarly, the cube issue also has a profound impact on agency – it’s often necessary to let someone else take the turn under your direction. It’s not a problem for play, but a lot of the fun of physical games comes from the direct manipulation of nice tokens, and the cubes are satisfying to place and clear away. They add considerably to the immersion. For those with communication issues combined with either cognitive or physical impairments, game play will become extremely difficult due to the combinatorial effect of not being able to manipulate tokens whilst also not being able to clearly articulate what you need done on each turn. For such compound conditions, it’s likely that it’s more ‘presence’ than ‘play’. Other people inevitably make all the interesting decisions and then move your pawn around for you. It becomes a spectator sport, which isn’t what we want from tabletop games. On the other hand, while the quarterbacking issue is bad for day to day play, it does mean the game supports dropping in and out to an unusually significant extent. If an experienced player can take your turn for you, there’s no pressure to continue when in physical discomfort, and no cost to you later coming back and resuming control. You may find you’re coming back to a world situation you had no hand in crafting, but a fresh perspective can be just the thing to revive a flagging team. It’s the best kind of situation for intersectional issues of discomfort. Pandemic isn’t an extremely long game in most situations, but if it’s being approached as a strategic puzzle it may last an hour or even two. For longer sessions this kind of player flexibility is extremely valuable. 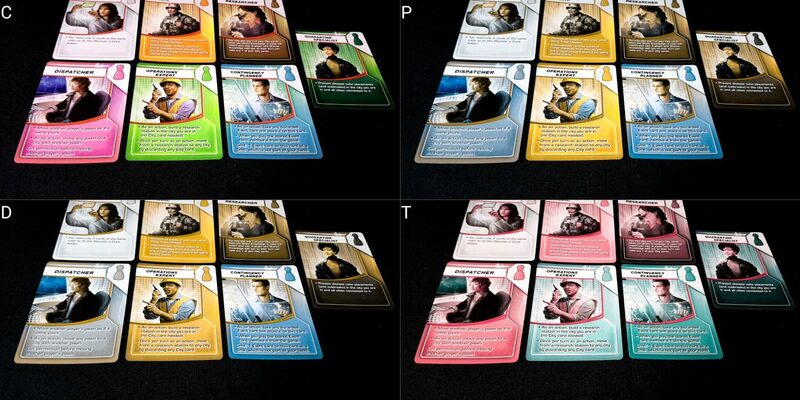 Importantly, it’s also a game with a definite end-point – when the player cards run out, that’s it. You know, at least roughly, how many turns remain before it’s all over. That can be important in scheduling rests and sessions of temporary suspended engagement with the game. Co-operative play has a very significant impact on many of the accessibility issues we discuss on this blog – rather than worrying you’re leaking intelligence, or putting yourself at the mercy of another player’s best interests, everyone is in this together. As such, it’s possible to be much more flexible about supporting players with different accessibility profiles at the table. 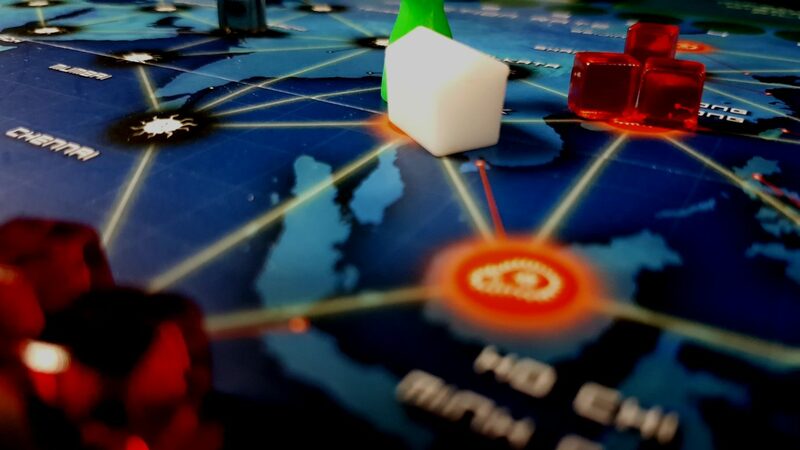 Much of the visual aesthetic of Pandemic though gets in the way of its playability for those with physical and visual impairments, and the ‘despair engine’ school of game design makes it a potentially risky bet for those with emotional and behavioural disorders. Pandemic is a legendarily difficulty game for novices, and this in turn creates difficulties for people with cognitive impairments. Perhaps the most interesting element of this profile is that the oft-derided quarterbacking problem is actually one of the game’s most significant features in terms of accessibility – if people can play your turn for you, it removes almost all of the pressure to remain playing in situations where physical or emotional discomfort may be an issue. Every cloud has a silver lining, and all that. We have concerns about Pandemic, obviously – but if you can work in a group where there are mixed-abilities, there’s something for most people to meaningfully contribute. Not that it really matters, because your absolute failure is inevitable anyway. But at least it means that when you drive the planet off of a cliff of disease and pestilence, your hand was at least partially on the steering wheel. Props on the rest of the work you put into this. Remember, I’m talking in that section about people with visual impairments – those lines that pick it out can very easily get lost and the dots that are spread over the map mean that you can’t even just rely on visual clutter. 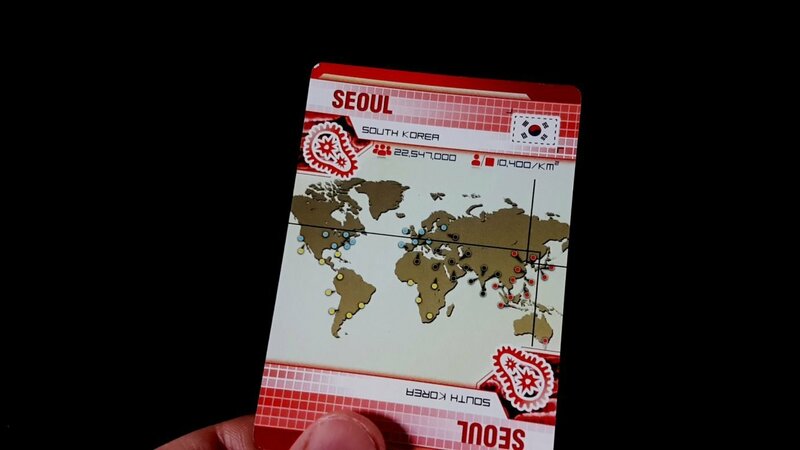 For the other card, I don’t say that it’s hard to see the city, I say it’s hard to see the country because of poor contrast.